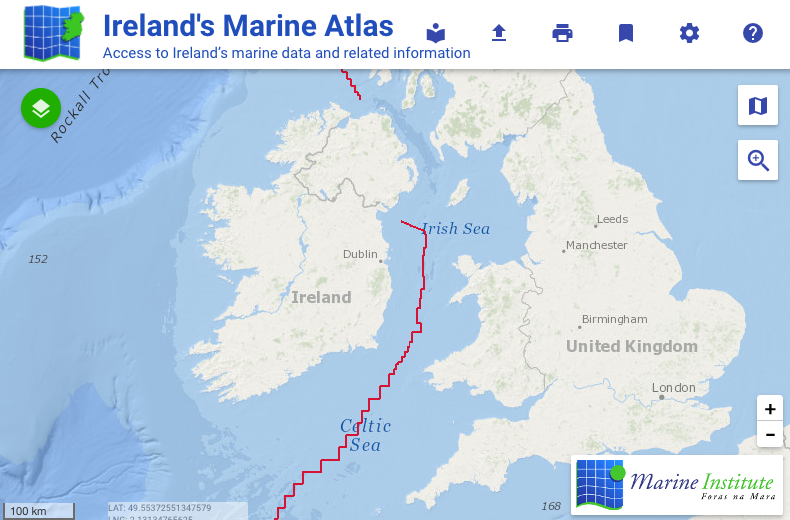 Ireland's Marine Atlas has been developed and maintained by the Marine Institute with initial funding assistance from the Department of Housing, Planning, Community and Local Government. The atlas provides a one-stop-shop to view and download marine environmental Open Data relevant to support reporting obligations for a number of environmental directives including the INSPIRE Directive, the Marine Strategy Framework Directive (MSFD) and the Maritime Spatial Planning Directive. The aim of the European Union's MSFD directive, for instance, is to protect more effectively the marine environment across Europe through the establishment of 'good marine waters'. Open Data provided via Ireland's Marine Atlas has been guided and enriched by the European Directive on harmonising environmental data across Europe within a spatial data infrastructure known as INSPIRE. INSPIRE Data Specifications (Data Models) have been used to manage this Open Data to the categories visible under THEMES in the atlas.